Free packet of VFT seeds with every Order! We are now offering a FREE packet of VFT seeds (10 seeds per pack) harvested a few weeks ago with any order!! Just write CLAIM SEEDS in the Substitutions section when ordering and we will add a free packet of seeds to your order. Triffid Nurseries has many satisfied customers all over the world and we have recently decided to start up a Customers Gallery where you can send us a picture of you and your favourite carnivorous plants! If you would like to appear in the Gallery simply email me via this website and attach your photo! To view the gallery, click here. Triffid Nurseries, founded in 1999, supplies a wide range of quality carnivorous plants and seeds suitable for both the enthusiast and beginner alike. We are very proud to boast the largest selection of carnivorous plant seeds held in stock, on the web! Well over 250 different species, hybrids, clones and varieties. Triffid Nurseries is located in Suffolk in a purpose-built, Kader growhouse covering over 3700 sq. feet - all dedicated to the fascinating world of carnivorous plants - The Food Chain in Reverse! The vast majority of our business is mail order with seed orders dispatched worldwide and plants sent throughout Britain and Europe. We regret that we are unable to send live plants outside of Europe. Please note that ALL PLANT ORDERS are made up each weekend and despatched on the first Monday after your order is received. PLANT BUYERS: During the autumn and winter months most of the plants (except Nepenthes) will go through into their winter dormant state. This means they are smaller, less spectacular, pitcher-less or even just root stock, rhizome or hibernaculae. As a result they can look somewhat underwhelming compared to their summer glory! Please bear this in mind when buying plants at this time of year. New growth will of course resume in the spring. Similarly, VENUS FLY TRAPS make awful Xmas presents for the same reason! NEWS: I am afraid that we can no longer send seeds to Japan due to Japanese Import Regulations. If you have any concern about your order, please email us directly. If you can't find what you are looking for, email us and we will do our best to source it for you. Superb Collection of Antique Carnivorous Plant prints and lithographs available for the true Collector. 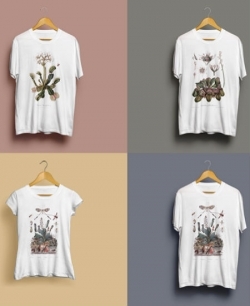 New range of Triffid Classic Botanic T-shirts now instock and ready for Summer! Recently we have been able to source some fantastically rare and more importantly, fresh Nepenthes seeds from some experienced growers abroad. Species like N.lowii, edwardsiana and more recently, N. macrophylla have all been offered and have generated much interest. To successfully germinate these Nepenthes seeds requires very specific conditions and, in my opinion, some degree of experience too, and I am always being asked how best to cultivate them. Rare and unusual carnivorous plants available for immediate delivery. Help and advice for successful plant care. 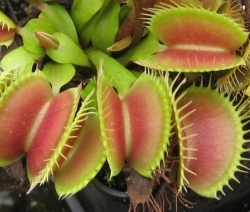 Suppliers of carnivorous plants, venus flytrap, aldrovanda, byblis, cephalotus, darlingtonia, dionaea, drosera, drosophyllum, genlisea, heliamphora, ibicella, nepenthes, pinguicula, sarracenia, gibberellic acid, seeds, sundew, pitcher plants, cobra lily, dewy pine, monkeys rice pot, butterwort, trumpet pitcher, tissue culture, plant kits, plant gifts, flytrap, insect-eating, insectivorous plants, educational books and antique botanical prints available to buy online.